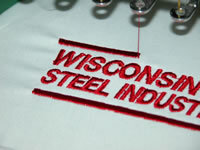 At Eagle we do all our embroidery "In-House". This keeps the quality high, the turn around quick and allows more money to stay in the USA. If you'd like a quote, please email your best quality artwork and the size (height and width) you'd like it to be. If you'd like to have a logo made or just want lettering, we can help you with that as well. Give us a call, we're here to help!